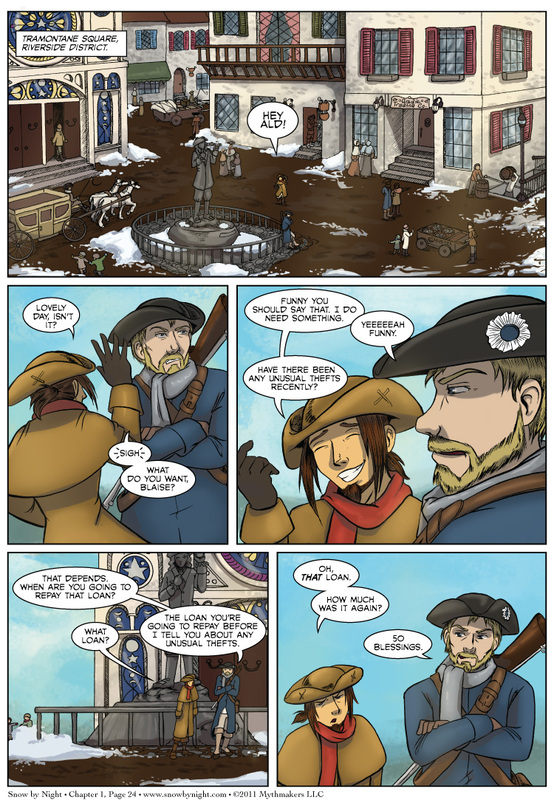 And Page 24 is up. We get to meet one of my favorite characters: Ald. He’s a gendarme (policeman) who is responsible for keeping the peace in the Riverside District. His name came about when Brittany was designing a custom 404 page. I wanted her to draw a picture of a gritty gendarme ready for action. She produced this great drawing of a bearded man holding a lantern up while scowling. Brit and Amy started calling him “Angry Lantern Dude.” It was only a couple short steps from there to A.L.D. and finally Ald. I uploaded a new incentive panel on Top Web Comics. To see a sneak peek at next week’s page, please vote for Snow by Night. Love the way he tells Blaise he wants a bribe! He sounds like my older brother! Really cool page and I love the origin of Ald’s name. It’s always interesting to learn where some of the creative sparks come from.